Ocala, FL (September 11, 2012) – Bruce Ekstrom of Tuigpaarden Farms in Ocala, Florida and Hackney Hill Farm in Shelbyville, Kentucky is well known for his philanthropic contributions to the equine community, and he has demonstrated a special affinity for therapeutic riding programs particular. Ekstrom recently donated Hemi, a sleek French Trotter, to the Marion County Therapeutic Riding Association when he recognized that the horse’s character and disposition would make him an excellent therapy horse. Hemi, who was imported from France, has won over a half million dollars as a roadster and driving horse. Horses4Heroes, one of the most successful equestrian support groups for the military, is riding into Nashville, Sunday, May 27, from noon to 5:30 pm with a special Operation Free Ride open house for military heroes and their families. The event is being held at A Cowboy Town in White’s Creek. Owner Denise Reynolds, herself a member of the National Guard and home from a recent deployment, knows a thing or two about sacrifice and service! “This is a great opportunity for our local military families to come out and enjoy not only a day with horses, but a fun-filled day of horseback riding, pony rides, panning for gold, canoeing, fishing, country western music and BBQ.” The event is free and open to anyone with Military ID. As Rottman’s “brain-child,” its success means the world to her. She had wanted to help the VTRC reach out to the younger generations and hold an event where everyone could come together and have a great time. The first time the event was held was at the annual dinner and auction three years ago. The response was so immense that the committee had to turn people away. Soon after, it was decided to make the “Buck Off” its own fundraising event for the VTRC leading up to the annual benefit. They have received overwhelming support from sponsors throughout the years, and this year Floridian Community Bank, Palm Beach Equine Clinic and White Horse Tavern Catering are to thank. As the president/founder/executive director of Horses4Heroes, Inc., I am pleased and proud to introduce our horseback riding organization to all troops, combat veterans, and military families! As you may or may not have heard, NARHA/PATH, the creator of the Horses for Heroes program, therapeutic riding for Wounded Warriors, has abandoned the use of the name Horses for Heroes and will be re-branding this therapeutic riding program. The other Horses4Heroes, our organization is able-bodied, affordable horseback riding for returning combat veterans and the entire family, which also needs healing and therapeutic interactions with horses! In addition, we serve all active duty military personnel, First Responders, critical care and hospice nurses and others who have physically dangerous and emotionally demanding jobs. Students at the Buffalo Therapeutic Riding Center. Photo Courtesy of the Client. Buffalo, NY – September 6, 2011 – The Buffalo Therapeutic Riding Center (BTRC) is pleased to announce that it recently received the prestigious Gray & Jerry Fadden Horse Whisperer Grant from the EQUUS Foundation. Each year, the EQUUS Foundation awards grants to charitable organizations that promote the positive use of the horse for the benefit of the general public. BTRC strives towards this goal as it promotes the unique bond between horses and people that can be particularly meaningful to children with disabilities. Based in Buffalo, New York, BTRC provides a safe, relaxing and non-academic environment for children with physical and mental disabilities to interact with horses, volunteers and peers. The grant will be used for scholarships, as approximately 80% of the children who participate are economically disadvantaged and unable to afford the lessons. BTRC is a PATH International Premier Center, which is the highest level of certification available to charities providing therapeutic riding to individuals with disabilities. Operating out of Buffalo, New York, BTRC is a non-profit organization that promotes and teaches horseback riding – noted for its social and therapeutic benefits – to disadvantaged and emotionally challenged children. Since 1990, the center has provided the experience of riding and caring for horses to children with a variety of disabilities. The program has expanded steadily and currently serves more than 170 children annually. For more information on Buffalo Therapeutic Riding Center, please visit www.thebtrc.org. WESTPORT, CT – August 31, 2011 – The Board of Directors of The EQUUS Foundation, Inc. is pleased to announce the award of over $270,000 in grant awards to 72 charitable organizations that are improving the quality of life for horses and the people who benefit from their unique ability to empower, teach, and heal. The Michele E. Arnhold Grant was established by the family of Michele E. Arnhold in 2008 in memory of Michele’s life-long passion, her pursuit of excellence and her commitment and contribution to the equestrian sport. The EQUUS Foundation selected the American Institute for Neuro-Integrative Development to receive the 2011 grant to underwrite the cost of providing therapeutic riding instruction to students with neuro-biologically based learning and developmental disabilities at the Giant Steps School in Southport, Connecticut. The program, which started as a pilot in 2007, is held at the Fairfield County Hunt Club in Westport, Connecticut, which donates the use of its facilities and horses. 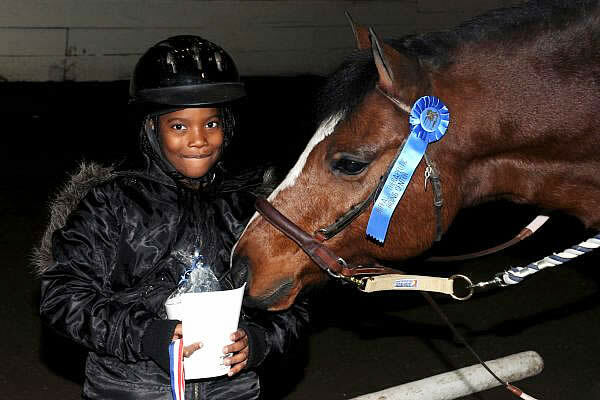 The Bridgeport Police Mounted Unit also supports the program by donating larger horses for the older children involved. Devon, PA (August 24, 2011) – 2011 marks the 20th anniversary of the selection of Thorncroft Therapeutic Riding Inc. as the beneficiary of Dressage at Devon. Since 1991, Thorncroft has received more than $1,000,000 from Dressage at Devon. These funds have been used to support students with disabilities who have shown a dedication to the sport and the horses. Steven Reed (left) is one such student. In 2004, when Steven Reed was 8 years old, his mom Linda, wanted to find an activity for her son that would help him grow and reach his goals. Knowing that Steven was an animal lover, Linda thought riding might appeal to him. Steven was hooked after just one visit. For the next several years, Steven took weekly, then twice weekly lessons – first on a pony (Blossom), working his way up to the horses he rides (and jumps!) today. Steven’s dedication to the sport and the animals continues to grow. He volunteers in the barn in exchange for one of his lessons, a job he took on at age 13. Sundays, Steve can often be found cleaning stalls and doing other necessary barn work. “Thorncroft is an amazing place. From the moment he started riding, Steven has not only learned horsemanship but has made many friends,” said Linda Reed. Steven received his first scholarship just one year after he began riding. And, among other honors, this year Steven was the recipient of the Grace Levin Scholarship Award. His weekly lessons include individual training as well as practice sessions with the Thorncroft Mainstreamers. The North American Riding for the Handicapped Association, also known as NARHA, originally formed in 1969, is now the Professional Association of Therapeutic Horsemanship International (PATH Intl.). The association tagline is “Ensuring excellence and changing lives through equine-assisted activities and therapies,” and is designed to reconstruct the now outdated NARHA model. Because equine therapy is such an evolving modality, there are now a myriad of ways in which horses can be helpful in the therapeutic realm. 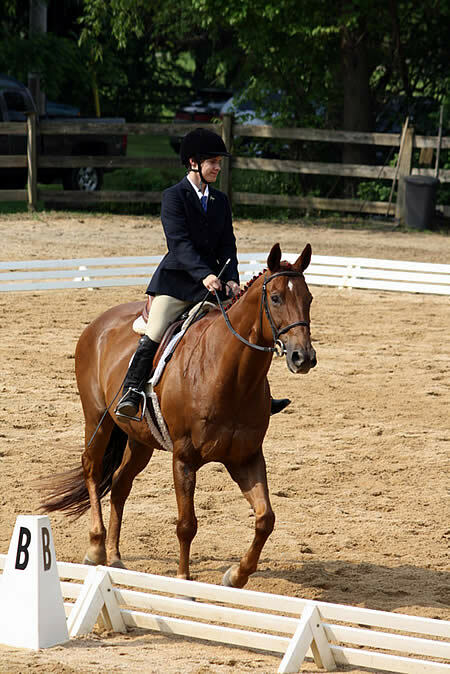 Yet NAHRA focuses mainly on programs that are designed for handicapped riders. However, NARHA is the oldest organization for any form of equine therapy, and therefore creates guidelines for all other equine therapy activities, including those produced solely for mental health benefit. Recognizing the obvious constriction of this setup, the NARHA Board of Directors voted for the name change for several reasons. Primarily, PATH is a much broader based organization, allowing for regulation of many types of equine therapy, including equine assisted psychotherapy, and learning. Lausanne (SUI), 6 July 2011 – Canadian actor, musician, recording artist, author and horse-lover William Shatner is supporting the HSBC Rising Star category of the FEI Awards, the scheme organised annually by the Fédération Equestre Internationale (FEI), the governing body of horse sport, to celebrate equestrian heroes. Shatner’s role as Captain James T. Kirk in the science fiction TV series Star Trek, which was first broadcast in 1966, made him a cultural icon and earned him worldwide fame. His more recent role as Denny Crane in The Practice and Boston Legal earned him two Emmy Awards and a Golden Globe Award. The actor breeds and shows American Saddlebreds and Quarter Horses and spearheads the Hollywood Charity Horse Show, which brings together world-class Reining horses and riders to raise money for a therapeutic riding organisation that works with severely disabled children. 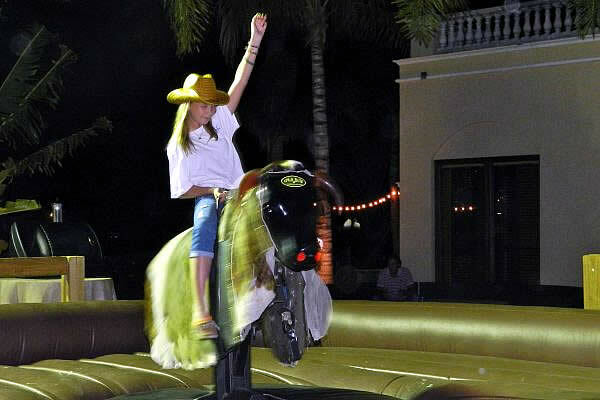 Loxahatchee, FL – May 4, 2011 – The Spring Horse Driving Trial at Port Mayaca Polo Club, Saturday and Sunday May 14th and 15th, will include a charity luncheon to benefit the new driving program at the Vinceremos Therapeutic Riding Center. The Luncheon will be held Saturday the May 14th during the Dressage and Cones portion of the competition in Okeechobee, FL. The competition will begin at 9 am and the luncheon will be served from 12 until 2pm. The competition is similar to 3 day eventing, including dressage, cones which is similar to the stadium jumping portion, and a cross country portion, including obstacles that will be driven on Sunday starting at 9am. Proceeds from the luncheon will benefit the start up of VTRC’s new handicap driving program. The addition of a driving program will allow the center to meet the needs of people who may not be able to ride but will enjoy the camaraderie of the barn and the excitement of competition. VTRC Director of Development Susan Guinan has been committed to starting a driving program at VTRC for sometime. She began driving in the 1980s, and has competed at Gladstone and Devon and many other shows along the east coast. She continued her driving while living in England and was involved with the RDA driving program. She is pleased to be able to bring this opportunity to VTRC.